'Brilliant' Mail on SundayTake a trip back to the era of troubled teens and awesome soundtracks; of Reagan, rap and Ridgemont High; of MTV, VHS and 'Axel F'; of outsiders, lost boys and dead poets; of Bill and Ted, Brooke Shields and the Brat Pack; of three Porky's, two Coreys and one summer when everyone called her Baby . 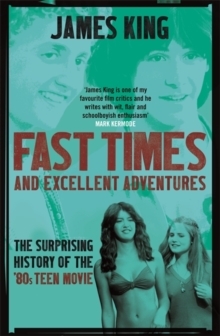 . . Fast Times and Excellent Adventures goes behind the scenes of a genre where cult hits mingled with studio blockbusters, where giants like Spielberg and Coppola rubbed shoulders with baby-faced first-timers and where ambitious future superstars Sean, Demi and Tom all got their big break. Music, comedy and politics - all play a part in the surprisingly complex history of the '80s teen movie. And while the films might have been aimed primarily at adolescents, the best tackle universal issues and remain a magnet to all ages. Time of your life, huh kid?From a late '70s Hollywood in flux to an early '90s indie scene that gave youth cinema a timely reboot, respected film expert James King smartly highlights the personal struggles, the social changes and the boardroom shake-ups that produced an iconic time in movie history.